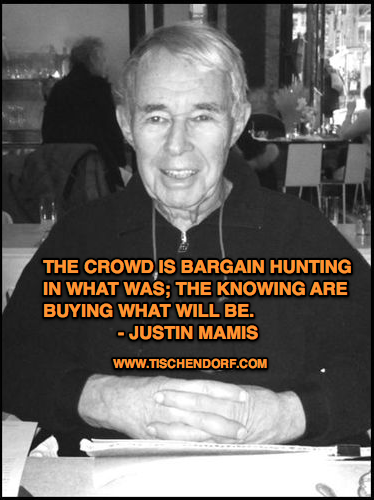 Time for another excerpt post taken from “When to sell” from Justin Mamis. Probably my favourite author. Do yourself a favour. Buy all his books and read them. Repeat the process. The best education you can get. This will make you a better trader and will provide you with tremendous insight into how markets work and how to deal with all the psychological aspects of trading. With experience, and with some grasp of what has consistently affected your judgment in the past, you should be able to determine at which times and under what conditions you function best…and when you should be extra-careful, or even stay away entirely. One important thing every professional knows, or ought to know since it is his business to know, is that he doesn’t have to play the game every single minute of every day. The advent of desktop machines and their ability to present right in your face what is actually happening every single minute of every day – and some with bells and whistles to call your attention to some petty and momentary thing that has just happened – has had its effect, though: the less experienced, the less disciplined, have become increasingly short-term oriented and excitable, more, in fact, akin to what we believed in the past that the public could be criticized for, of playing a game, of having a predilection for continually being in the market in one way or another. “Isn’t there one stock worth buying?” was a common question during the massive 1973-74 bear market, and still is. There is no rule that says you always have to have action; yet that is perhaps the most disastrous of all the common errors we’ve noticed. Rather than continually confronting the market on its own inscrutable terms, stop and ask yourself what you know, whether what you know is enough to act upon, and how you are relating to it. Maybe it is a period when the market’s personality conflicts with yours, or something in your extra-market life is hampering your ability to view stock action objectively, or, simply, perhaps it’s a time when the market’s course isn’t clear to anyone. Then it is best to step aside. You owe it to yourself to find out exactly how ready and able you are to play, because it’s yourself you end up playing against.